Chinese depiction. Now, just figure out which one is Zhuangzi. Zhuangzi was a Chinese Taoist philosopher of the Warring States period with a deep influence on Chinese Buddhism. He was famous for telling parables and inventing koans. 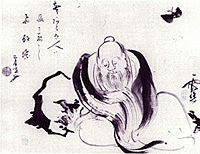 A few centuries later, Zhuangzi's style got mixed up with Mahayana Buddhist theology to create the school of Chán, known to the West by its Japanese name: Zen. However, in the West, he is best known as the man who couldn't figure whether he was a butterfly and is hence half the Trope Namer for Schrödinger's Butterfly and proof that All Just a Dream is Older Than Feudalism. The Other Wiki has more here . Koan: His sayings, though they predate Zen Buddism, are very koan-like. Starving Artist: Given that he didn't care to butter up patrons to have any sort of regular income, he was frequently living below the poverty level. He turned down a cushy government post by comparing himself to a tortoise (revered in China for their longevity) who was happier in a pond in the middle of nowhere than stuffed and mounted as an idol to worship. I hear the ruler who gave you that position suffers from oozing sores and offers great rewards for those willing to lick them and relieve his pain, however briefly. So, how many sores did you lick to get your job? He once visited Lu, Confucius' home state, and the ruler there teased him about the lack of popularity of Taoism compared to Confucianism. Zhuangzi replied that if the ruler wanted to find out how many of them were really serious about Confucianism (as opposed to the ones that only liked the fancy clothes and/or prestige that came along with it), he should enact an edict to put to death anybody who only paid lip service to Confucianism. A friend of Zhuangzi once described a tree on his property that reached to the sky, but its trunk and limbs were so twisted and gnarled that its wood would be useless for construction and no carpenter would look twice at it. The friend then told Zhuangzi, "Your words remind me of my tree; big and useless." Zhuangzi replied, "If this tree on your property is so useless, and no one will cut it down, why not lie under it and enjoy the shade it provides?"